Oh man. These onions. So many onions. I swear I’m not crying. These aren’t tears, it’s eyeball sweat. YOU HAVE NOT WON, CHEN YU SHAN. 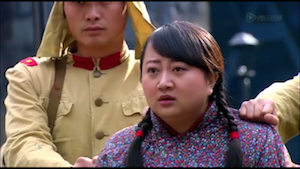 The episode starts with Chun Hua begging Shi Tou to let Bai Lang live. The serious turn in this drama has made their relationship not so cute anymore and a tad whiny and annoying. I’m not sure why she would stay with someone that would manipulate and seek revenge against someone as so, and hurt so many people that she loved, but I guess I can’t expect her to uphold the same moral standards as I do. In other words, f*ck you Shi Tou, you little sh*t.
Yao Mei Er approach Jiang Xin, Xu Guan and Jie Wen to see what she could do to help. 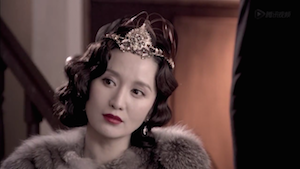 After reassuring them that she is trustworthy, Xu Guan reveals that they are going to do the same switching trick that Jiang Xin had used initially during the magic show (in the first episode). This can only work if Bai Lang can wear a black bag over his head during his execution. Yao Mei Er goes to approach Shi Tou and Lei Ba Tian to convince them. Oh. You’re all spiffy now with your hair back eh? 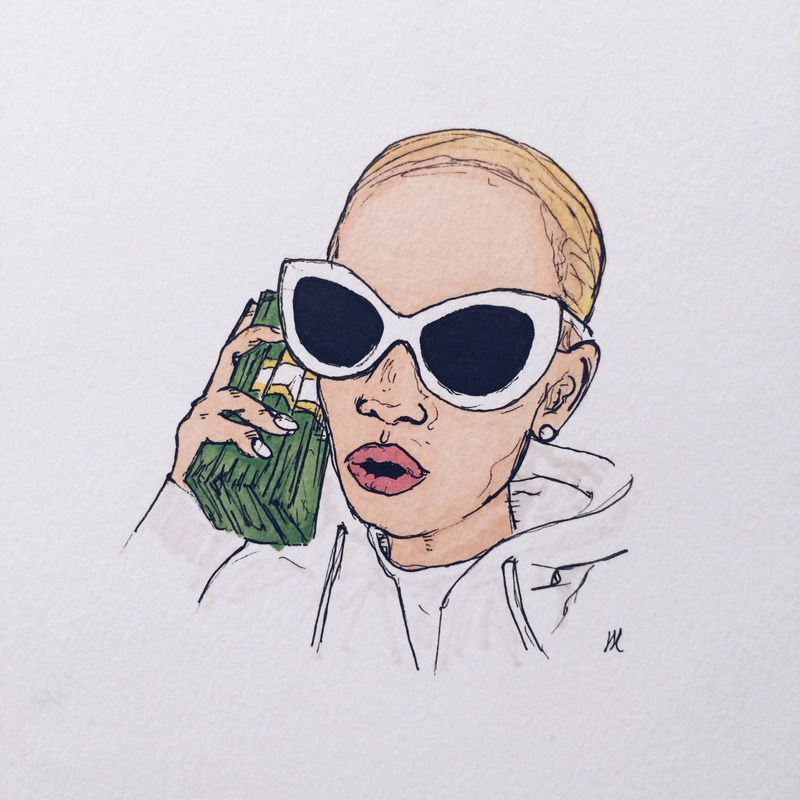 D-bag. Wait, what? Ok Shi Tou proceeds to stab himself in the arm afterwards to ‘return the favour’ back to Bai Lang. Apparently none of the producers understand the correlation between the depth of a wound and the severity of a wound because Shi Tou’s arm is completely unaffected after this scene. Omg. And this is where the tears start falling. 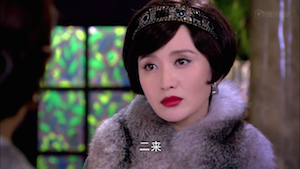 Lei Bai Tian shows up to the Bai mansion, and he offers to fulfill Yao Mei Er’s request of putting a bag over Bai Lang’s head during his execution – only if she slept with him. When she followed him to the bedroom I was internally screaming “NO WHAT ARE YOU DOING, HE’S OBVIOUSLY NOT GOING TO FOLLOW THROUGH”. Lei Ba Tian takes Yao Mei Er to see Bai Lang one last time. At the same time he reveals that even though she slept with him, he’s not going to execute Bai Lang with the bag over his head. 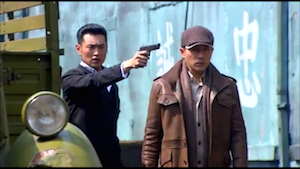 Yao Mei Er begins to plead him and beg him on the floor – but her real purpose was steal Lei Ba Tian’s gun. Well good job! Just don’t lose it like how Mama Ye lost it. 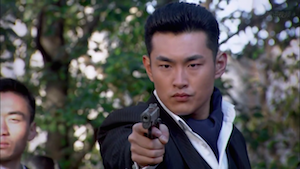 Even though the gun is pointed at Lei Ba Tian, Yao Mei Er manages to screw it all up. She gets distracted by what Lei Ba Tian says, which is “How do you know if there are bullets inside?” which doesn’t matter really, because if you fire, you don’t lose anything. But in her moment of distraction he wrestles it easily out of her hand (which I mean, your hand is already on the trigger, just shoot him goddamn) but, drama. He ends up shooting her with that gun, and a piece of my soul weeped silently and died. The Japanese guy that we saw in episode 5, 6 called Song Ben returns. 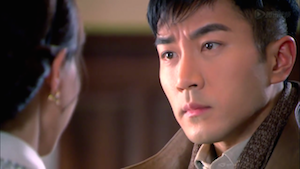 He confronts Lei Ba Tian for stopping one of his shipments. 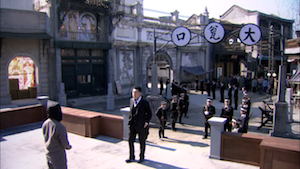 They had a deal – if Song Ben helps Lei Ba Tian take down Bai Lang, then Lei Ba Tian has to allow all shipments to go through. The reason that Song Ben didn’t was because it was a shipment of firearms. He was ok with letting cocaine through, but firearms meant that he was helping the Japanese fight the Chinese. 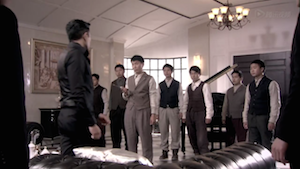 Song Ben bribed Lei Ba Tian’s men to turn on him upon his refusal to comply. You deserved that 100%. Also I would like to note that it only takes one gunshot to the head to effectively kill someone. Meanwhile, Xu Guan reveals to Jie Wen that Bai Lang was a good brother all along. 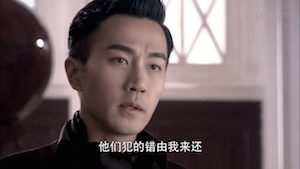 Jie Wen always blamed Bai Lang for his mother’s death and his temporary blindness, but Xu Guan revealed that it was actually not Bai Lang’s fault. Xu Guan goes into a whole monologue about how revenge is a paradox and revenge only fuels more revenge – that’s why it’s better to try to stop the cycle. Shi Tou decides to honor Yao Mei Er’s last wish by putting a bag over Bai Lang’s head before he executes him. The whole plan was weighing on this decision which was very questionable – what if Shi Tou changed his mind – or even forgot the black bag? 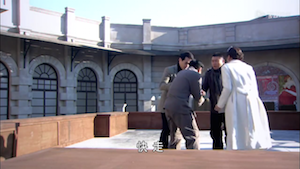 Jie Wen pretends to get revenge on Bai Lang by punching him in the stomach, causing him to topple over. He whispered to Bai Lang to stay down. There was secretly a secret compartment inside the execution stadium that Xu Guan was in, and he rolled out in the same prisoner outfit when Bai Lang was down. He distracted Shi Tou and the guards by running away, and they thought it was him. I would like to note that huge gaping entrance to the stadium offers full view of what is happening, but, drama. 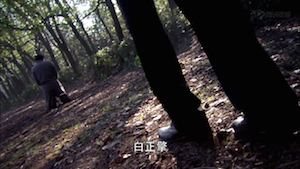 Shi Tou shoots Xu Guan in the leg (who he thinks is Bai Lang), and slowly inches towards him, ready to execute him. Why he didn’t just shoot a prisoner that attempted escape at point blank was beyond me, because for some strange reason he decided to slowly inch towards him with a gun. If you think he’s armed, why don’t you just shoot him? If you don’t think he’s armed, then why don’t you walk a bit faster and hurry up? Because, my friend, drama. ARGH it always gets me when they show flashbacks of a person who died. Xu Guan ends up blowing himself up to hide his identity as Bai Lang. 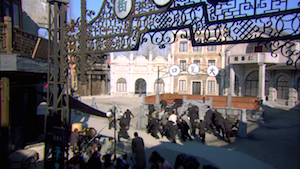 Shi Tou receives a letter a few days later where Xu Guan reveals that it was actually him who Shi Tou killed – it was his plan all along to sacrifice himself to end Shi Tou’s need for revenge. 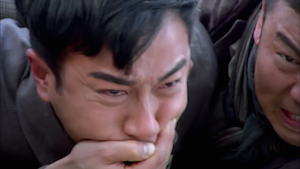 He knew that Shi Tou would honor it if Shi Tou found out that Xu Guan had sacrificed himself. Shi Tou follows Bai Lang to the gravesite where Xu Guan had died. Ironically before Bai Lang leaves, he swears to avenge Xu Guan by killing Song Ben. I mean, after Xu Guan had this whole thing about revenge is pointless and that revenge fuels more revenge (and that’s why he sacrificed his life to end the cycle), Bai Lang misses the whole point to try to avenge him. Bai Lang and Jie Wen reconcile – and they agree to work together in removing the Japanese from China. They have such a brotherly nice time that I suspect that one of them (or both of them) die tomorrow. For some reason, Jiang Xin and Bai Lang have a chemistry-less scene. They both apparently love each other and are relieved to be reconciled – but at the same time they are both saddened by what has happened as well as the war. I think they both really couldn’t act all those emotions out at once, and it was just a very stale scene. Bai Lang finds out that the Japanese has been doing human testing on the Chinese. Normal civilians were taken as prisoners of war as testing subjects of poisonous gas. People in other parts of China were missing suspiciously – and now Shanghai. Bai Lang suspects that the testing lab has moved to Shanghai and he’s determined to chase the Japanese from China. I know it’s been widely debated and quite controversial, but after all the books I’ve read about Japan’s invasion of China (notably Nanking), I felt so sad when watching this part because I knew it was partially true. There were a lot of pictures and clips to back this part up, but to this day, certain people don’t acknowledge that human testing occurred on the Chinese. Some people even claim that it’s Chinese propaganda to smear the Japanese government – I can’t claim if anything’s for sure but the information that I’ve read over time are all from Western sources. It’s just upsetting when history isn’t acknowledged, because it means that we can never move past it until it is. Bai Lang’s new look is so handsome. He looks so handsome in his thick cardigan. Bai Lang and Jiang Xin have another chemistry-less scene. Am I whining too much/expecting too much? Maybe I’ve been denied of OTP scenes for too long that I feel nothing when I finally get it. Shi Tou finds out that Song Ben was doing human testing on the Chinese in Shanghai. Shi Tou refused to participate in the activities of Japanese warfare against his own people, but Song Ben revealed that he has Chun Hua as his hostage. Song Ben reminds Shi Tou that Shi Tou was actually the one that invited him into Shanghai (while Bai Lang had intelligently kept Song Ben out). So it can be said that it’s all Shi Tou’s fault for the Japanese warfare activity against Chinese civilians in Shanghai. Shi Tou just looks shocked, with an expression that says “Oh sh*t. I dun goofed”. Well I’m glad you know Shi Tou, you really did, you f*cking walnut. Well nearly all my faves are dead, and all that’s left is Bai Lang. Bai Lang, Shi Tou, and Jie Wen work together to release the prisoners of war and to drive the Japanese out of Shanghai. Meanwhile, as Chun Hua is captured, and somehow the situation has turned into exchanging one hostage for another – Bai Lang for Chun Hua. Personally I think Bai Lang > Chun Hua, but you know, drama. Finale tomorrow!!! I don’t know what other daily drama I should watch next – give me a shoutout if you have a good recommendation! 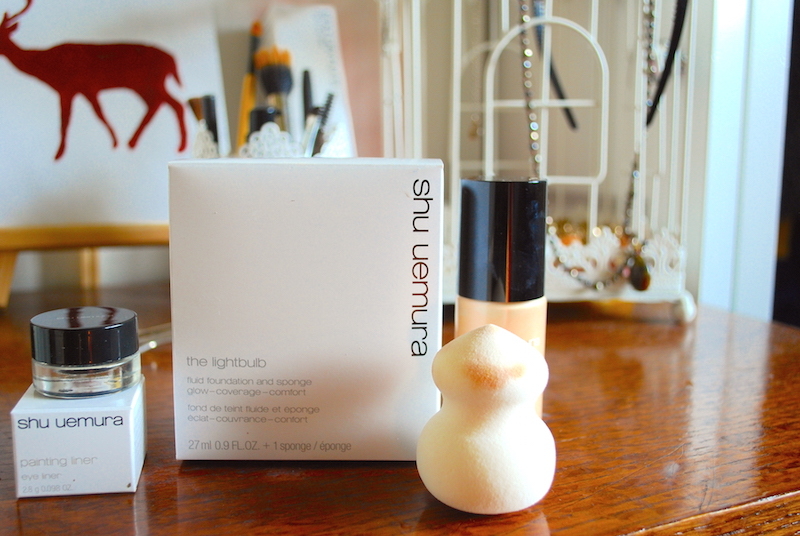 Thanks for your review again. First, I like to mention the Japanese were cruel to chinese. My grandmother served as a military nurse back in china and she told me that it was a common sight to see floating chinese heads (of children) in small rivers and missing body which are presumingly eaten by the Japanese. Their cruelty had no limits. However, my grandmother is still alive and she does not hate the Japanese anymore. Back to the drama, I agree that JX and bai lang is lacking chemistry. They had much more back then. But I really think it’s because they have a lot going on right now and both are constantly worried about the Japanese. I agree the hug just looks very awkward. They can’t smile or laugh in this situation so it makes the atmosphere more tense and serious. She’s scared of losing him and he is scared she get hurt. So can’t expect them to go back to like they were in earlier episodes. Those days are sadly gone. Dunno why my comment got cut off, but after the first sentence, I meant to say: I don’t get it… If Japanese invasion is coming, shouldn’t Jiang Xin be looking to get the hell out of Shanghai? Shouldn’t they ALL be looking to get the hell out? Sooo much pride involved in this drama regarding “doing the right thing”. Clearly Bai Lang saw how doing the right thing morally has led to a mass killing of his family members, so why do it again here? >_> Oh wait, this time it’s because all his family members died for HIM. Thanks for the recap! KIYU, you have such sharp eyes. I had to look for the scenes you were talking about. I can’t believe its the series finale already. One of my favorite C-dramas is Waking Love Up with Tang Yan and Roy Chiu. It’s super cheesy and has the amnesia bit in it as well. I think you’ll like it if you havent already seen it. Ahhh! Ican’t wait to see it!!! Thanks for the heads up ❤️! I found raw version on YouTube just now!!! Are we really getting happy ending?!!!! Lol I couldn’t help but snicker when JX is crying in BL’s arms when he comes through the door, and he’s all like… “Shitou saved me” while she’s weeping like a baby. I’m just thinking in my head: “Don’t think she cares man, she’s just happy you’re alive”.